From the beginning, Ballantyne has epitomized responsible development. Over two decades ago, Ballantyne’s master planners began their commitment to creating a strong infrastructure from family farmland. The developer has dedicated large areas to active open space within Ballantyne by creating over a dozen mini parks, two USGA standard putting greens, a daily fee Audubon-certified golf course and several beautiful ponds that enhance the natural habitats and overall experience. 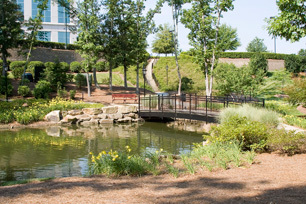 In addition, Ballantyne offers extreme connectivity, featuring 16 miles of sidewalks and bike paths as well as a low impact fitness trail with 20 exercise stations. Northwood Office believes it has a responsibility to its employees, customers and the community to be sustainable and do what it is capable of to protect and preserve natural resources and encourage healthy lifestyles. Ballantyne features more than two million square feet of LEED® Gold certified office buildings, representing one of the largest commitments to the development of sustainable fully speculative office development in the Southeast. In addition to its significant LEED development, Northwood Office’s commitment continues through innovative strategies in environmentally sustainable construction and site development, water savings, materials selection, indoor environmental quality and energy efficiency. Northwood Office owns and/or manages 41 properties that earned ENERGY STAR certification in 2018. Ballantyne has been recognized by the industry’s most prestigious organizations for its commitment to sustainable practices.